See what the hotspots for 2017 retirement will be. As 2016 comes to a close, retirees can look forward to all that 2017 has to offer. Although the future is uncertain, real estate experts are making predictions for what’s to come in the top real estate markets for 2017. 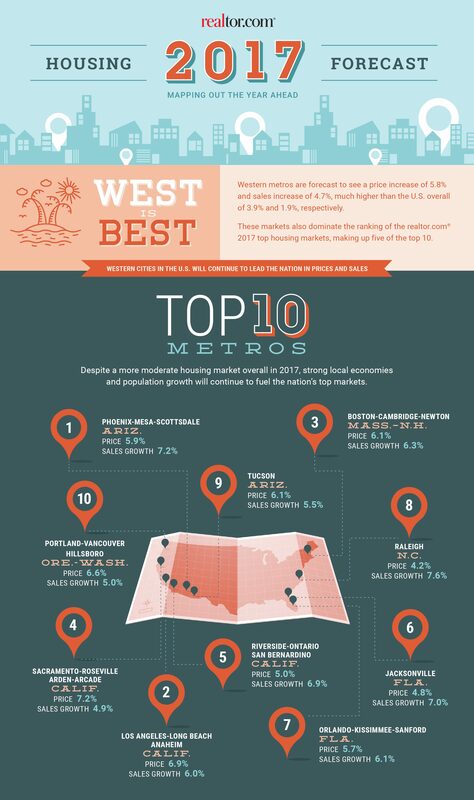 Despite a moderate-to-slow pace for next year’s housing market, industry experts predict that a large population growth and a strong local economy are some of the driving factors that are making some of these housing markets thrive. According to realtor.com’s housing trends for 2017, Millennials and Baby Boomers will be the driving force in homebuying over the next year. While Millennials flock to cities like Boston and Los Angeles to purchase their new homes, Boomers approaching retirement are making an impact in metro areas like Phoenix, AZ and Jacksonville and Orlando, FL. Retirees may want to check out these top housing areas if they are thinking of buying their dream home in an active adult community next year. The Phoenix area, which includes Scottsdale and Mesa, has been one of the popular retirement destinations for many years for active adults. According to realtor.com's market forecast, the Phoenix area will be a booming housing market in 2017 with median home prices in the $300s. The housing forecast also shows a price growth of 5.94% and sales growth of 7.24% in the area. This is good news for retirees looking to purchase a home within an active adult community in the Phoenix area. Fortunately for them, they can search for their dream home in numerous 55-plus communities throughout the Phoenix, Scottsdale, and Mesa areas that include resort-style communities like Sun City, Terravita, or Encore at Eastmark. It’s no surprise to see Florida on this list thanks to its large population of retirees residing in the Sunshine State. Northern Florida’s Jacksonville area offers active adults beautiful river and ocean access as well as plenty of parks, outdoor spaces, and urban attractions. The area has median home prices in the high $200s with 4.79% in price growth and 7.03% in sales growth, making it one of the top markets in next year’s housing forecast. The Jacksonville area features some world-renowned active adult communities developed by premier builders like Del Webb. Homebuyers can find affordable resale homes in Sweetwater by Del Webb in Jacksonville, FL or new construction homes in Del Webb Ponte Vedra, which is just 20 miles south of Jacksonville. Although Orlando is known for amusement parks like Disney World and Universal Studios, the city made the number seven spot in the top market list thanks to its price growth of 5.69% and sales growth of 6.10%. Average home prices in Orlando are in the mid to high $200s, which makes it affordable for retirees to purchase a home. 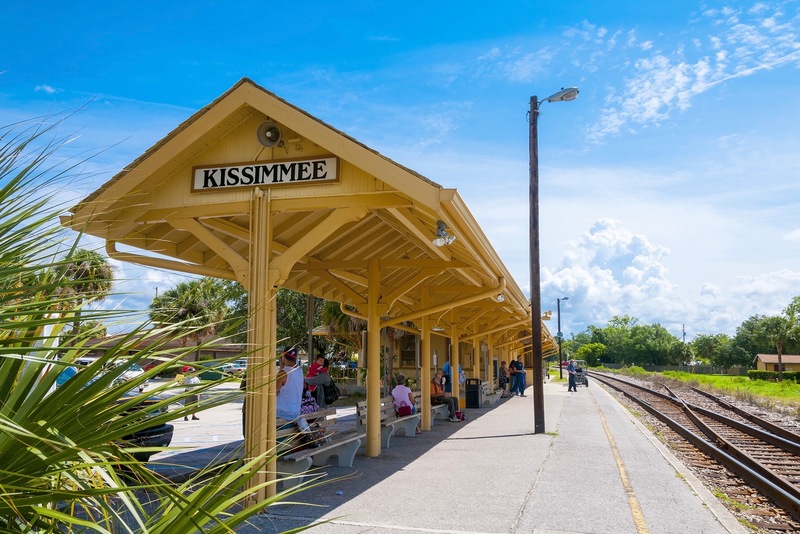 The Orlando-Kissimmee area is buzzing with new active adult communities that offer new home designs and resort-style amenities that appeal to the 55+ crowd. Some of the age-restricted communities in this area offering new construction include Twin Lakes and Serenity Reserve in St. Cloud, Enclave at VillageWalk in Orlando, and The Lakes at Harmony in Harmony. Buyers can also purchase affordable resale homes from established active adult communities such as VillageWalk at Lake Nona in Orlando and High Vista at Ridgewood Lakes in Davenport.